• Preheat the oven to 180°C. Baste the butternut, red peppers and garlic with olive oil and roast for about 20 minutes in the oven or until tender. Remove the vegetables when they start to brown and caramelise. Peel, deseed and slice the pepper. Cut the butternut into cubes. • Fry the onion in a bit of butter in a potjie. Squeeze the garlic from its skin. Add the garlic, vegetables and the rest of the ingredients to the potjie. Simmer for 15 minutes. • Blitz half of the soup in a food processor and return to the pot. Add more water until the consistency is to your liking. Season to taste and let the soup cool down. Pour into ziplock bags and freeze. 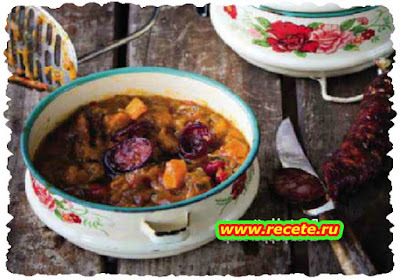 To serve: Thaw the soup and heat gently in a pot Add slices of fried chorizo or a dash of cream.